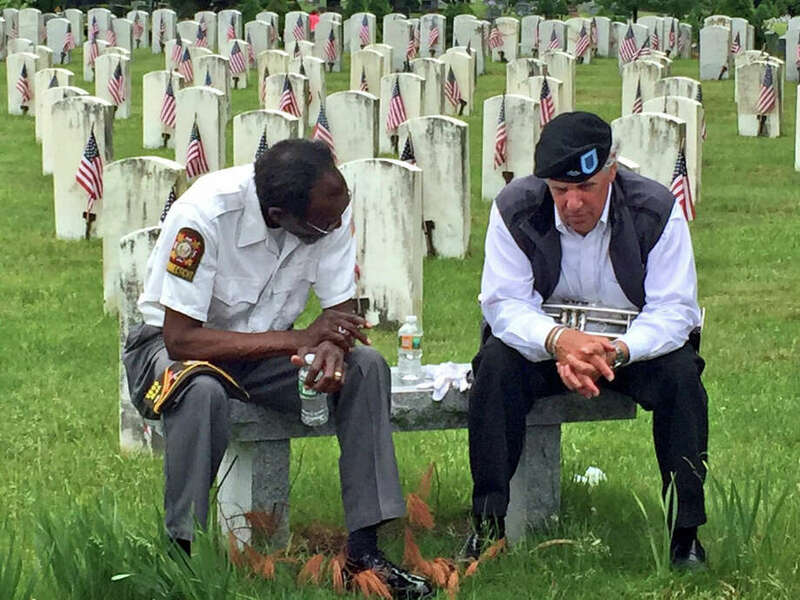 DARIEN — Vietnam veterans Dennis Clayburn and Anthony Montimurro sat on a bench in Spring Grove Cemetery and shared a moment after Monday's Memorial Day parade. The words were little more than whispers, but sometimes among veterans, that’s all they really need. Clayburn, 67, served in the U.S. Navy and lives in Fairfield. Montimurro, 69, served in the U.S. Army and lives in Stamford. Both men have a deep and distinct appreciation for those who have served their country. Oscar E. Peck is buried just a few steps away from where Clayburn and Montimurro were seated. Peck is Connecticut’s youngest Congressional Medal of Honor recipient. He earned the distinction as a 14-year-old powder boy in the U.S. Navy during the Civil War. In 2012, Peck was honored with an inscription at the base of the cemetery’s military memorial.